As a group, we are committed to the dissemination of information to the industry about technology advances and opportunities to improve the roofing process and business. Our goal is to have the entire industry receive these informative newsletters. Roofing Technology Think Tank (RT3), an emerging technology-focused group of roofing industry thought leaders, and SmartBrief, a leading digital media publisher of targeted business news, are seeing success with their partnership to promote technology throughout the roofing industry. 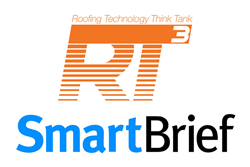 Launched December 11th, Roofing Technology SmartBrief powered by RT3 is a subscription-only publication that provides essential technology and diversity news and thought-leadership content three times a week to over 11,000 roofing professionals. RT3 is focused on serving the needs of the roofing industry with ongoing education, research and dissemination of their findings. “The Roofing Technology Think Tank (RT3) is a consortium of thought leaders exploring emerging technology solutions for the roofing industry, striving to inform roofing contractors by bringing together progressive and disruptive solutions that help build the professionalism and appeal of the roofing industry,” is the mission statement for the group. Learn more and subscribe to Roofing Technology SmartBrief powered by RT3. Additional information can also be found at https://rt3thinktank.com. Serving nearly 6 million senior executives, thought leaders and industry professionals, SmartBrief is the leading digital media publisher of targeted business news and information by industry. By combining technology and editorial expertise, SmartBrief delivers the most relevant industry news – curated daily from thousands of sources – in partnership with leading trade associations, professional societies, nonprofits and corporations. Using industry expertise and an engaged network of readers, SmartBrief’s content marketing offerings cut through the clutter and provide real solutions to targeted business needs.